Deathhammer has always been a band possessed of that highly sought, cult 'it factor' since their inception, but then, that's not much of a shock as the members have been hanging around other classy Norwegian underground fixtures for years. Prominent figures in that scene have touted them as a band to watch, but up to this point I admit that I've never been thrilled by their music. Let's be honest, throwbacks to the Venom, Slayer and Bathory camp are hardly novel, and though the band had an unquenchable fire and energy to their earlier recordings which made them 'fun', the songs on Forever Ripping Fast and even their 2010 full-length Phantom Knights did not exactly resonate for me beyond a few weeks. That all changes with Onward to the Pits, an album upon which they seem to have finally gelled as songwriters, even if their modus operandi is one and the same with its predecessors. Make no mistake about it, this is pure leather, denim and velocity given audio flesh, and its proprietors have no concern other than to live vicariously through their influences. The dense onslaught of the percussive, hyper speed guitar tone draws a straight line back to mid-80s Kreator circa Endless Pain or Pleasure to Kill, while the vocals draw upon Mille's abusive, bloodied carnage with a few thrusts into Tom Araya's formative, line-ending screams. Clearly the raw speed and violence with which they carve out numbers like "Deathrashing Sacrifice", "Voodoo Rites" and "Emperor of Sins" are a clear nod back to the Bathory s/t debut in 1984, and as usual you get the feeling they've been reared on Venom and Motörhead at some point, though the influence might feel further removed due to the intensity of the blasting beats and hellish, focused fire of the album's atmosphere. But Deathhammer do not just rifle their way through a bunch of average, dirty black/speed metal songs here and call it a day like so many others. The Norwegians have very meticulously constructed this thing to provide other thrills, like the tolling bells and cement chord grooves that inaugurate "Emperor of Sin", or the jarring organ in "Lead Us to Hell". Leads liberally dispersed through the track list provide an added dimension of musicality as they soar off into the night sky above the rapid, rhythmic witch burning below, and in general each is well constructed to draw the ears back to it repeatedly. They also shift tempos enough here that Onward to the Pits does not suffer from the monotony of many peer albums. Frilly, old school Destruction and Bathory explode in "To the Evil" or "Fullmoon Sorcery", for example, but then "Final Black Mass" and "Seduced by the Flames" have mid-paced, bouncing rhythms which prove just as threatening. In the end, it all accrues into an admittedly great album which dusts up the floor with their prior releases, and should absolutely blow the minds of everyone seeking to relive 1985, or to ford those faux-Satanic depths for the very first time. Hells Headbangers Records remains a perfect home for the duo. The production is brutally clear but has just enough of that retro flair that it never seems sterile or plastic, and Sadomancer and his partner Sergeant Salsten perform the duties of four men with ease. 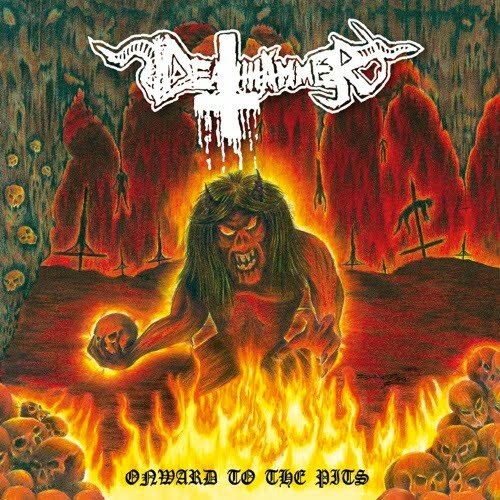 As usual for Deathhammer and a lot of their contemporaries, one should go into the record expecting innovation lyrically or musically, just a thrill ride from the past to the present, so bearing that in mind, it passes with flying, devil-scorched colors. It's not poetry, just a pastiche of predictable blasphemy, but they still get in a winning line or two like 'we rip the arms off Jesus and eat his head'. Just shut the mind down and bang thy head if you can keep up with their frenzied pace. The more beers, the better, of course, but I found it was also effective sober.